Traditionally goat meat/lamb is used to cook the Laal Maas, and is served with maize or millet flatbreads which are soft but crusty and smeared with a generous amount of butter. Since there are not many in my family who would appreciate lamb, I decided to play safe with the chicken, without changing any of the other ingredients or the process. As the above name suggests, this is an intensely spicy dish and the warm vibrant red color of the curry comes from nothing but the chili peppers. You must have got it by now that this is not a dish for the “fainthearted”. While we were in India last month, I had the opportunity to experience this Laal Maas at a relative’s farm house. This was the first thing that I saw on the dinner table. The rich red shimmering curry made every other dish fade into oblivion. Even before we started the dinner, I asked for the recipe. But the cook refused; he wanted me to try it first. I chickened out after one bite. I was positively the “faint hearted”. The spice and the heat compared to nothing I have had before. Even the ice cream after dinner could not soothe my poor tongue. But the immensely wonderful flavor lingered as I was wanting to get a few more spoonfuls but dared not. Instead I walked into the kitchen and caught hold of the head cook of the house and asked for the recipe. He smiled – I think he saw my tear brimmed eyes; the fiery curry that made my eyes well up. He gracefully told me the recipe, in minute details and I am ever so thankful to him. Once we got back here, I was looking for the first opportunity to give this a try. After a couple of weeks there came the time when we called some friends over. Laal Maas it was going to be, the spicy red color and all, but at a more tolerant level . I used the Kashmiri Red Chili Powder, which does impart the red hue, but with way less fire and heat than the traditional “real red chilies”. What is most striking about this recipe other than the color is the use of plentiful garlic and adding some more minced garlic at the end of the cooking process. The raw garlic added after the cooking is done, entirely transforms this dish and imparts this unique flavor. I realized this is what makes this recipe so very different from any other chicken curry. As I cooked, this irresistible aroma hung around our home that drove my children insanely impatient. They wanted lunch at ten in the morning. The chicken took another hour to cook. I was ecstatic as the aroma seemed as familiar and real as in the farm house and at that moment I knew that I got it right! If you love “spicy”, and I don’t mean just the fire, do give it a try. I promise you won’t regret. The recipe is family and friends approved and loved by all! Skin the chicken if they are not already done, wash and pat dry. With a sharp knife, make 2-3 deep slits in the chicken drumsticks. Cut the other chicken (if you are using mixed parts) in to 2-2.5 inch pieces. Rub the lemon juice, salt and the chili powder to the chicken pieces, reaching inside the slits and let them sit for about half an hour. In the mean time combine the rest of the ingredients for the marinade. After half an hour, toss the chicken pieces in the marinade and set aside. Let it rest for about 4 hours at least, overnight works best. 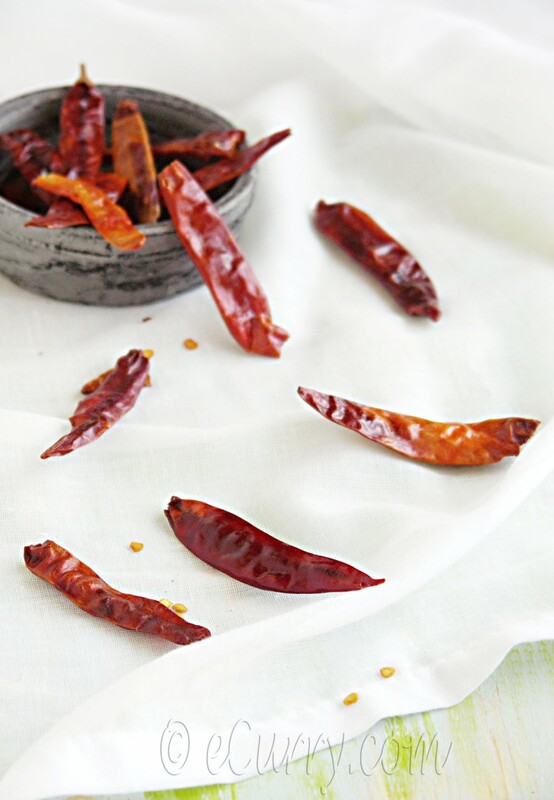 If you are using dry whole red chilies instead of red chili powder, soak whole dried chili in warm water for sometime. Then grind to a smooth paste using little water. Heat oil in a large thick bottomed pan. Add the thinly sliced onion and cook slowly until they are fragrant and start to turn golden to brown. They will almost caramelize and this process will take anywhere from 20 – 35 minutes. Once the onions are near done and a lighter shade of brown add the bay leaves, cinnamon, cardamoms and the clove to the pan. Saute for about a minute and add the marinated chicken pieces. Save any extra marinade. Increase the heat and make sure the chicken pieces are in a single layer (try your best) as they need to be browned. Cook the chicken while occasionally tossing them, coating them with the spice mix and onions and browning them on all sides. All the pieces should have light brown spots. It will take about 15-25 minutes approximately. Add the ginger paste now, toss and cook for a couple of minutes. In 1/2 cup water combine, Chili Garlic paste, coriander powder, turmeric, ground whole chilies/chili paste OR red chili powder and salt. Add the extra marinade to the pan if you have any. Add this spice and water mix to the pan and cook slowly at medium heat while tossing the chicken pieces and spices frequently. Cook for about 15 to 25 minutes (the time will vary – watch for the oil to separate and leave the sides of the pan) until there is almost no water and the spice mix separates and the oil leaves the sides of the pan. Add the 6-7 cups of warm water, tightly cover and cook until the chicken is done and almost falling off the bone. Towards the last 15 minutes of cooking, open the lid a tiny bit for some water to evaporate and have the right consistency of the sauce/gravy. The curry should be soupy and should start to look cooked with the patches of red oil, floating on the top of the curry. Switch off the heat if done and cover. If you feel there is too much water left (the consistency will be soupy with lot of liquid gravy to dunk your bread in), partially cover and cook for some more time till it reaches the right consistency. Once all done, cool for about 15 minutes. Uncover, add the drained yogurt, stir it in and simmer at very low heat for no more than 5 minutes. Now add the minced garlic, stir it in and cover tightly until ready to serve. This dish tastes even better the next day as the spices and the flavor of the garlic infuses and blends well with time. Drizzle some lime juice if you wish before serving and serve with flat breads (tandoori roti/Naan/Makki ki roti etc) or any crusty bread. Never keep a cooked meat curry uncovered until ready to serve. Keeping it covered seals in the moisture and flavors and prevents the meat from getting “tough”. I often get comments and emails mentioning that the dish they tried out from my blog, did not have the colors they see in the photographs. The red color of a curry may be dependent on a lot of things. If you are using store bought chili powders, or dried chilies, keep in mind all varieties and brands are different and might impart different colors to a dish. In my kitchen I use Kashmiri Red Chili Powder, and if you compare this to any other chili powders, you would know the difference in colors. Again all brands of the Kashmiri Chili Powder might not be exactly same. If it is a tomato based curry, again the hue will depend on the kind of tomato or how ripe they are. The goal is not to get the exact colors to match the photographs, but to get closest to the taste of the recipe. 🙂 Thank you much for your support and appreciation! MMmmm.. Delicious looking. I love hot and red chicken curry. Gotta try this recipe soon 🙂 Would be great in winter! Aiyyo Soma, I want this. NOW. Its so gorgeous. That dish is splendid! It has such a beautiful and appetizing color. 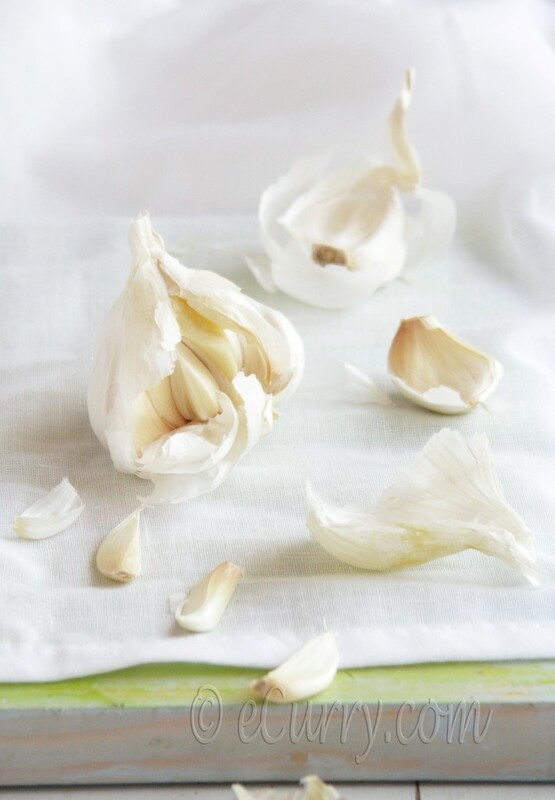 I love garlic; can never get enough of it. Oh boy, this looks SO good Soma! My dad makes chicken do pyaza which is kind similar to this but I ma sure he will be delighted to know about this one. He is our family cook if there’s anything chicken/meat cooked in the kitchen and is always on the look out for a new recipe. Thanks so much for sharing! Soma through your post I almost visualized you enjoying this HOT and red meat with teary eyes !! Boy !! this looks so tempting I’m going to bookmark it and will substitute here mutton ofcourse. Looks very delicious. I love all the pics… fabulous !! what a colour Soma. Lal maas dekhechilam TLC er akta program e. tomar ta oder rannar thekeo bhalo hoeche. between thanks for your comment on my blog. ami bishesh somoy paina tai rojkar rannai beshi post kori. maa didimader eisab recipe ektu ektu kore to harieyei jachhe. tomar bhalo lage dekhe khub anondo hochhe. ebarei bolbo bhabchilam kintu tumi byasto thakbe bole bolini, next time ele aboshyoi amar barite asbe ak bela. amar maa darun ranna koren. sab tomar pachonder dish banie khaoaben bolechen. I have heard about this lal maas but never got to relish it..I thought game meat is used to prep this…and what a color you got..loved it..so mouthwatering..
A fried just tolds me today is national spicy food day and we were hunting for a spicy chicken recipe. This would be perrrfeecct! A dish NOt for for the fainthearted- yeh baby. This dish is for me then! I love a hot and spicy curry and I’m definately tryign it this Ramadhan. One quetsion, can I reduce the quantity of oil? And thanks for the tip in the end! Dear Sukaina, Thanks ! 🙂 yes u can def. reduce the oil.. but then it will taste a little bit different as the oil takes care of frying that much onion and spice mix and also the chicken.. if you see the amount of chicken that went in it (1 cup for 3 lbs) – its about 1/3 cup / lb. Do adjust that amount to you convenience, but DO NOT skip the chili garlic paste and the adding of the minced garlic at the end. The gravy or sauce sound delicious, Soma! Love the color .. so rich! You know how much I want to visit Rajasthan and eat all those exotic dishes out there. 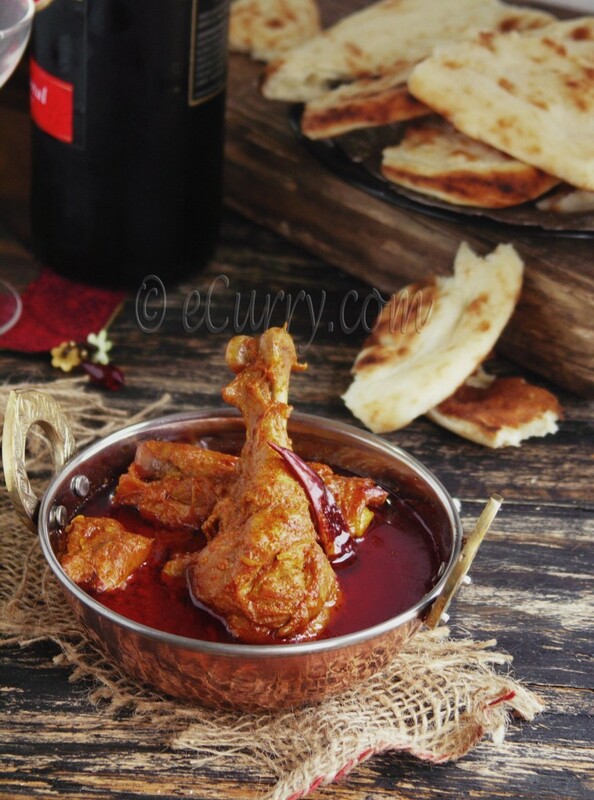 I have so many chicken dishes of yours and they all rocked.. this is next in my list. Love that color of chicken & love the spicyness of it….Lal mirchi(lots of), ghee/tel & rajasthani food goes hand in hand……to tell you the truth never heard of lal mass, our spicy encounter of rajasthani food always starts and ends with Kachori & mirchi wadas(with kari) for breakfast almost every other day while we are there…but now I want to taste lal mass on my next trip, though I have your fool proof recipe but I’m sure I’ll never be able to put those many red chillies, I can go high on green chillies but not red…..btw enjoyed reading about your trip…. Looks deliciously spicy!! Great recipe. Wow! Thanks for the recipe- I’m going to try this out for my heat loving husband! 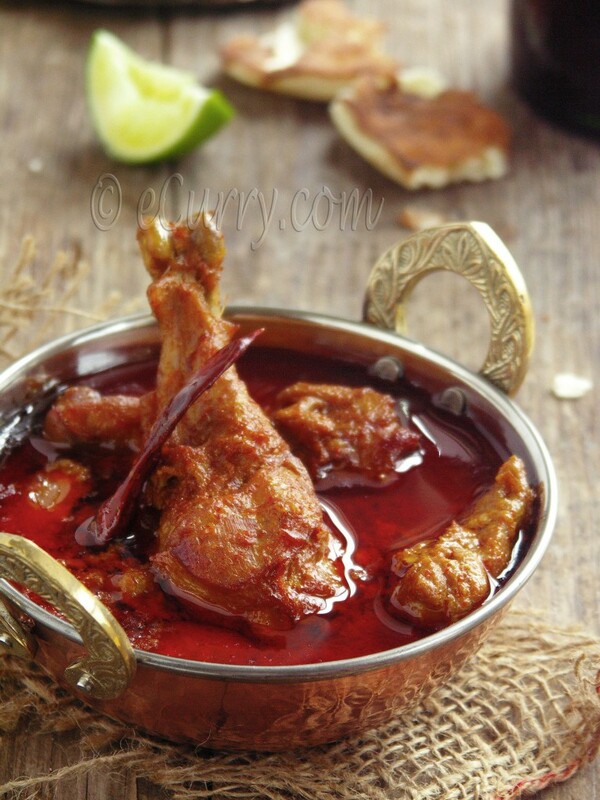 This recipe is an authentic one from Rajasthan. As I have mentioned in the post, I had asked someone who had made it. This is a dish supposed to be made with a lot of oil, garlic and chilies. What I do here in my blog, is try to post recipes as authentic as possible, esp. the traditional ones, It is entirely to the readers to modify them and adapt them to their own needs and criteria. So go ahead and do it! 🙂 Cooking is all about experimenting and then making something your own, isn’t it? Yes the Kashimiri chilies have the color and not the heat. That was my purpose as I did not want this to be so spicy that my family could not eat, and yet have the vibrant color the authentic one has. Please feel free to use regular chilies. Thanks for your response.. fair enough.. I agree, kashmiri chili powder brings out amazing texture. Thanks for your clarification and views on the oil usage. I can’t wait to try your recipes.. Cooking it right now…..could not be man enough to use 1 cup of oil or 7 cups of onion (sob/sniff) and bought “Deggi Mirch” specially for this purpose (I heard they give wonderful red colors) Will let you know! Masha Allah.. its awsome. Insha Allah will try soon.. thank u habeebti for sharing.. bless u.. plz keep posting. I like your blog because of two things – the recipes are no-shortcut-no-nonsense authentic recipes, and the second one is that the process of cooking is detailed and very well explained. For me, it helps immensely to know when exactly to add what, and what to avoid, and what are the absolute musts. Living abroad for a few years now, I have been pining for the best resturants and flavours back home. I was a foodie, but never a cook, but staying abroad has made me want to cook the things I yearn to taste. That’s why I find your recipes so wonderful – they do not SKIMP in any measure. That’s the secret of fabulous Indian cooking – some of the ingredients and the Quantities are not for the faint-hearted, yet, that’s why they become legends. I am glad you are loyal to that. 1. the oil is required to fry all that stuff – one cannot cut down on it. However, what I tend to do is that afterwards, when serving, I drain off the floating sea of oil to some extent. I somehow cannot overcome my guilt in eating that pool of oil … So, instead of cooking with less oil, one can drain some of it off from the top, when ready to serve. 2. 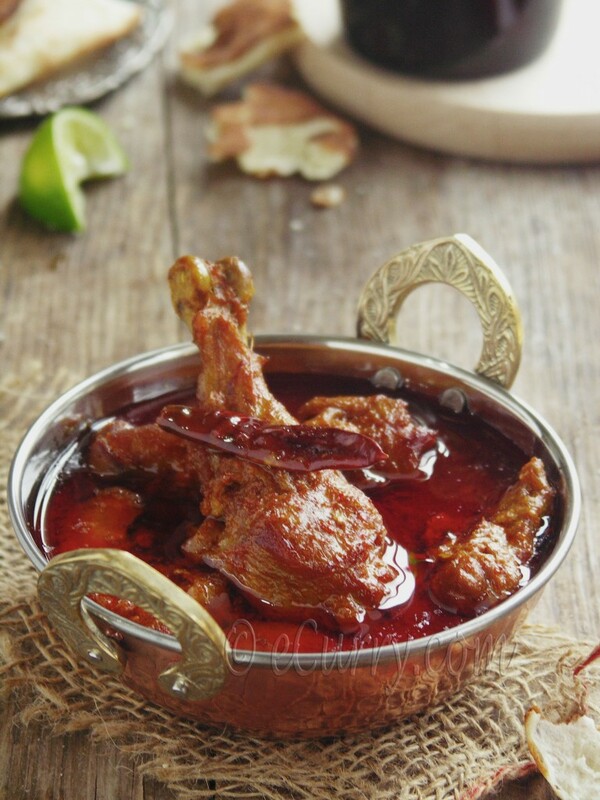 A quick qs – I want to make the old fashioned lal maas with mutton. How much mutton would be appropriate for this recipe and is the rest more or less similar? I want to especially know about the procedure – is there something different that we would do with mutton? 3. If we add the whole garam masala spices after the onion is fried, would there be enough oil to temper the spices with? Or is it supposed to get mish-mashed in the onion fry ? Thank you for your wonderful efforts. Today being Diwali/Kalipujo, wish you and your loved ones a Shubh Deepawali. I am inspired to try the lal maas early next week, after hearing back from you. Thank you very very much for the comment! Makes me really happy:) and it made my day! Happy Diwali to you and yours too! The original recipe which I followed (from a chef in India) was actually made with mutton. There are not many mutton lovers in my family so I made this with chicken. The recipe is EXACTLY the same with mutton, and I followed it to the T as he had told me. I did not want to mess it up as that was the best cooked dish I had ever had. The only thing i did was the lemon and salt rub on the chicken which he had not told. I always do that with most of my chicken dishes as all of us in the family can’t stand any fleshy smell of the meat and this process gets rid of it. So you can do it with mutton or skip it. YES! pour out the oil after cooking 🙂 it is so true that you cannot cook with less oil, as it won’t taste the same, and I am not ready to take any arguments about that 🙂 cooking that much onion in less oil just won’t happen. The whole garam masala will cook in the oil of the onion and will have the flavor. But if cook you will see that the garlic smell will dominate everything here. the garam masala will only be a subtle hint. I hope I have answered all of them. If you need to just write. Wow, that is a recipe in detail . Attractive. Thanks to “Hamaree Rasoi”, I could access this recipe. Coming here from hamaree rasoi. I am totally lost just by seeing your recipe. Am not an expert in cooking non-veg foods but love to learn to satisfy more my familymembers. I am bookmarking this. Thanks for the recipe. Made this yesterday and like all your recipes turned out so well. Thanks for the effort you put in to make it really clear. love it. I tried this recipe yesterday and it turned out to be awesome.Thanks for sharing it. You can use any oil. I have used white oil here. But mustard oil can be used for a deeper and more rustic flavors. Hi i tried the recipe and it was wonderful just as it was shown in the picture. The color! The aroma! The taste! I am bowled over Soma!!!! I have been tasting the soupy gravy by the spoonful even as I cooked! Thank you so much for such a gem of a recipe! Even though it was a pretty elaborate recipe (which I usually shy away from), I am going to make this one many times! I have tweaked the recipe a little bit here and there but still the end result was so awesome!! And yeah, I was a little skeptical about the amount of oil, but boy oh boy, every last drop of it was absolutely necessary! Tried the recipe today and thank you very much for sharing this great recipe. I saw quite a few on net but your seems most authentic. I used Paprika for color. The one I used I think I could have been more bold with red chile and but less with ginger. Just made this tonight. Delicious! Followed the recipe exactly, except I found I had to add a small quantity of sugar at the end to balance the flavors (there was a bit too much “bite,” if you know what I mean – this is probably because I used storebought ginger paste, which has a fair amount of vinegar in it). Boy is it ever hot, though. My roommates and I are sweating! Thank you so much for your website and recipes.